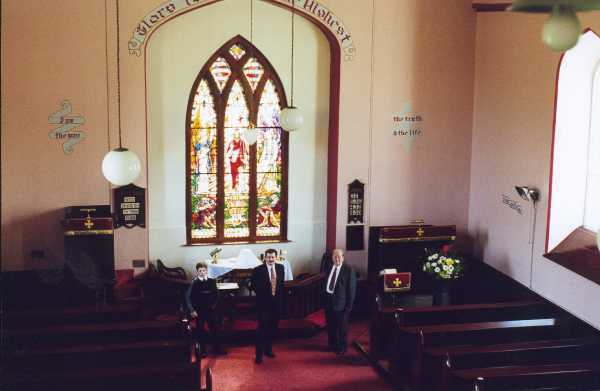 An interior view of Riverstown church Co Sligo. We arrived early and managed to take a few photographs before everyone turned up for the dedication service which took place at twelve o'clock on the 13th Aug 2000. This is the view from the choir stalls at the rear of the church with Matthew my son on the left Hugh my brother and Wilton my father on the right. The newly installed window above the alter is a fine focal point and now it's cleaned there is a wealth of detail which can be seen once again. I am sure that many more people will see the window now as the church is at a very prominent point at one end of the town. For a closer view of the whole window click here and to see it as it was in Toomna church Co Roscommon click here.